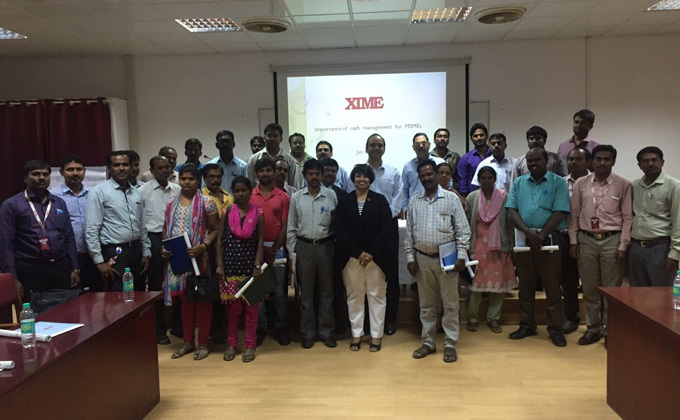 As part of its mission to encourage and support entrepreneurship, XIME Bangalore organized a half day seminar in association with Kinara Capital for MSMEs on 6th January, 2016. The topic of the seminar was “Importance of Cash Management for MSMEs”. Thirty micro and small entrepreneurs attended and benefited from this event. Prof J Philip, President, XIME and former Director, IIM-Bangalore addressed the gathering and emphasized the importance and contribution of MSMEs to the growth of the Indian economy. He also reiterated that XIME is always happy to host events like this to boost and support entrepreneurial talent in the society. The seminar which highlighted the importance of Cash Management for MSMEs was handled by Dr. KB Vijayakumar, Sr. Asst. Professor, XIME. Tips, techniques and methods of cash management were shared with the participants. Ms. Hardika Shah, Founder-CEO, Kinara Capital also spoke on the occasion. Prof Mukesh Hegde, Dean – Entrepreneurship Development, XIME and Dr. Bhavani Akkapeddi, Sr. Asst. Professor, XIME coordinated the seminar.